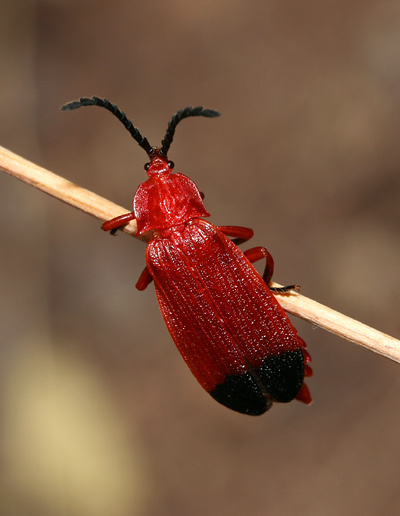 Here in Arizona, Bloody Net-winged Beetles (Lycus sanguineus) can be observed on short flights or perched in vegetation in riparian areas. In April of 2008, I observed this one in Agua Caliente Canyon in Arizona's Santa Rita Mountains. With the sun glowing through its red elytra, the colorful Bloody Net-winged Beetle flew past me and landed in some dead grass along the recently dried stream. 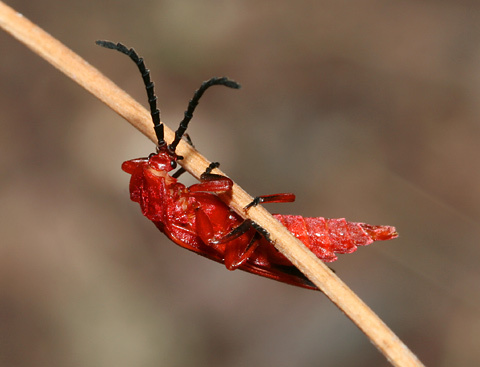 Bloody Net-winged Beetles are soft-bodied and mostly blood-red in color with black-tipped legs, black antennae, black eyes, and black-tipped elytra (modified forewings that serve as wing covers). Like other Lycids or members of the Net-winged Beetle Family (Lycidae), Bloody Net-winged Beetles have a netlike pattern of raised veins on their leathery elytra, a wide, flattened pronotum (the area behind the eyes), elongated mouthparts, and broad, flattened, often saw-toothed antennae. Net-winged Beetles typically have aposematic (warning) red, orange, or yellow and black coloration meant to warn potential predators like birds that they are noxious or foul-tasting. Bold patterning with bright colors and black are a widely understood warning sign in the animal kingdom that a creature is either inedible and/or dangerous. This Bloody Net-winged Beetle's red color made it very easy for me to spot, and this conspicuous beetle would be in great danger from hungry, sharp-eyed birds if they didn't understand that its colors were a warning to leave it alone.